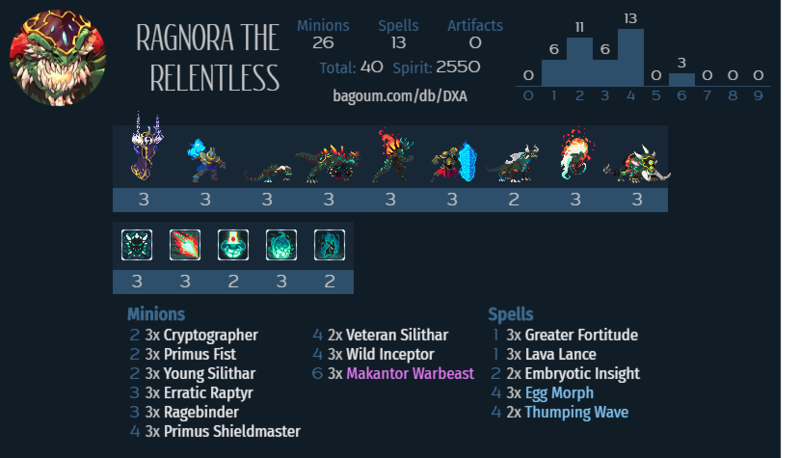 It almost feels irrelevant to do this as there’s already a bunch of good budget Ragnora lists floating about, at least if I had made it more like my full on combo list then it would differentiate it, but honestly the more robust list with access to Makantor’s is likely to serve you better. The combo version is good and given I had to play it the 80 or so games I’d prefer to be playing that since I love casting Abjudicators, but it’s hard to beat the reliability of just running better minions across the board and Makantors at your top end. I have still kept Thumping Wave in though, it’s just a nice removal option, and you will run into opportunities to use it in a super combo here and there, but without some of the guff for ensuring a proper combo there’s plenty of room to add actual good cards to the deck instead. Play minions, your minions are great, then play spells, your spells are also great. You can use Inceptor just for tempo or removal purposes, same with if you need the transform of Egg Morph. While it’s nice to hold onto a combo it’s by no means the only strategy, that said putting Greater Fortitude on anything other than a Ripper feels like a mistake, but you can make in game judgement calls to decide for yourself if and when it’s worth it. If they go above 3 attack then using it elsewhere or replacing makes a lot more sense unless you want to try the forbidden double or even triple fortified Ripper. I can’t quite describe the deck as an aggro deck, and tempo encompasses a lot, but it’s a strong deck that should more often than not be playing aggressively and trying to get ahead on board and initiative. I decided that for these list I could be free of a hard 2000 restriction, which meant that adding Makantor in was a bit of a no-brainer. There’s a couple of instances in these budget lists where I could have had a very cheap list, but added a higher rarity card, and that’s because in those cases I think that it just adds too much to the deck to pretend like it’s not useful, if you want to play that deck archetype or even faction, then it’s just a sensible craft. Makantor Warbeast is just simply one of the better cards in the whole game, so if you want to play Magmar why would you not craft it? This gets included in every Ragnora deck due to how favourably it interacts with Rippers. Generals have 2 Attack, Fort gives Rippers 3 HP, this lets them survive one counterswing by a general, with celerity they can attack again. Add that all up and you get 10 damage off your 1 mana Ripper and your 1 mana buff spell. You can make this more reliable by adding in a Hatch card (which I cover next), but the simple possibility of this means that every Egg your opponent cannot clear they should now be wary of it dealing them an immediate 10 damage, 40% of their HP. Though it’s main use is in that scenario Greater Fortitude is actually just a fine card in general and can create a good amount of value or damage when applied to a most any minion if you feel like that is the best line of play at the time. As I mentioned a bit earlier this can add on to the Ripper combo to add it’s 5 attack twice to a Ripper if you have also gotten it’s HP up with Fortitude. The result being a monstrous 20 damage to punish your opponent for thinking they could stay close to an unhatched Ripper Egg. That’s just one possible use in the deck though, sometimes adding what seems in comparison to be a meager 5 damage atop of an ordinary minion’s attack is all you need to finish a game. But very important is the flexibility that this card has to be a immediate ranged transform removal to deal with any large backlined threats that you may be otherwise unable to answer. The highest Impact you usually can get from these is likely hatching a Ripper in order to get the combo described above though that doesn’t mean that it’s bad to use these outside of that case, far from it. Sometime using Egg Morph to clear a huge threat is arguably a better deal anyway, but dealing with even a medium threat now is often a better way to progress the game than saving it for a burst combo somewhere down the road, this can be somewhat hard to judge but if you are not sure if or when you will have a good chance to use it later and it looks like a good opportunity now then go for it, and if you are not sure then you can always look over the replay later and think about all the possibilities of how the game would have played out with or without using it. Inceptor I tend to be a lot more happy to use to just hatch eggs, do deal with stuff or to preserve your rebirth minions. It’s usually good tempo and that will often more than make up any out of hand you lose by the damage and opportunity granted by the board control. Also keep in mind that there are 6 hatch cards, so using 1 or 2 here and there in the early midgame still puts you at a good number to draw into to close it out. I’m just listing all our egg minions together even though they are not all equal. Firstly Cryptographer stands out, since it’s only inderectly a rebirth minion as a result of reactivating your BBS but it’s a very powerful ability because Rippers are a powerful unit, creating more and always asking your opponent if they have the answer demands a lot from them and can put them under a lot of pressure to allocate resources and positioning correctly. Another nice thing I like about Crypto is it can sort of fill out a curve a bit by being servicable on 2 or 3 mana under the right circumstance, so that’s a nice bit of flexibility. Young Silithat and Ragebinder are the efficient workhorses, fine stats for the price and then stick rebirth on it to make it a pain to deal with efficiently and synergise with a couple of our other cards. Raptyr’s kinda funky, and a bit weird to play with sometimes, if it just hits the enemy general once then gets cleared it didn’t really do what you want of it, and it can be kept at bay or neutralized by even just a single small minion, but can do work to clear your opponents mid level threats and create space for you. It works great with Inceptor too. Veteran Silithar is kinda weak, but benefits just enough from some of the synergy in the deck for in to be useful enough to run. Lava Lance is quite close to disgusting for it’s cost to damage ratio now that you can reliably trigger it with Rangora. 4 damage deal with a lot and you can easily be sniping off 4 or 5 mana duders for your 1 mana reply, then slam your own large minion in their face and keep up the aggression. Embryotic Insight also benefits from having an Egg in play, actually it needs one to do anything, whereas Lava Lance still deals 2 at worst. I digress, Insight is an option to let you cheaply draw up in the situations where you need just a little more gas in the tank to get over the finish line. Yep these guys back again, good minions for controlling the board. Fist in particular is a cheap way to add extra damage onto a Ripper combo in the right situation. The Provoke on Shieldmaster can very much help to protect your vulnerable Eggs, so all good stuff. Eggs actually has a lot of scope for how you can take it, the full Abjudicator is pretty fun, but not as competitive. I personally believe Zoetic Charm to be near busted for strength, but can make you fragile if you rely on it and they’re packing artifact answers. Alongside Progenitor for example it can be very potent. Spelljammer (or Mentor) are good for the tempo/aggro variant. Extinction Event also sees some play to top out your curve and as insurance against dispel on your Eggs. There are a number of good lists floating around by now so see what you like from them and your playstyle to decide how you may like to take it.